After nearly a decade together, Stacey and Seth decided to seal the deal in the city where it all began. The couple met while attending college at Drexel University. It only made sense that they’d exchange their vows in the heart of Philadelphia! They selected Vie, a stunning venue on Philadelphia’s iconic Broad Street. No detail was overlooked – from the floral arrangements that matched the bridal party bouquets to the flawless cake decorated in Philly and Drexel designs. Even the gorgeous latticed walls reflected the couple’s unique and fun-loving nature. Vie is one of Cescaphe’s elegant Philadelphia venues. It was inspired by French Provençal design in every way. It includes a stunning Italian mosaic, custom lighting and staging, and a spacious setting to celebrate with all of your guests. With the talented hands at Beautiful Blooms, Stacey and Seth had the perfect backdrop to an even more perfect wedding ceremony and reception. We wish all the best to Stacey and Seth as they embark on their new journey as husband and wife. Congratulations and thank you for allowing Allure Films to be a part of such a special day! 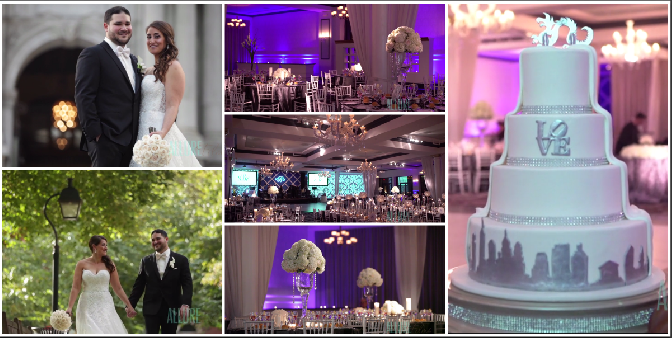 Click here to speak with an Allure Films representative about our wedding video packages for your big day.